Shielded within the hedrons that had grown up over the bones of Ugin, Naiva knelt beside her twin sister, holding a knife to her throat. Baishya was lost to a whisperer's trance, eyes closed, fallen deep into a vision Naiva could only share if she was touching Baishya's bare skin with her own. Magic lived in her twin and was denied to her. Envy and anger gnawed at her guts until she was nothing but jagged splinters. Why was she constantly told she had to protect her twin? Wasn't Baishya nothing more than a burden and a danger to the tribe? It would be better if her sister were dead. Then she wouldn't be treated as the lesser one ever again because she would be the only one. And in the years to come, people would forget Baishya had existed at all; they need never know Naiva the great hunter had ever been a twin. A thin line of red welled up along the curve of her sister's neck. Yet as Naiva breathed, struggling with the harsh thoughts, a stillness slowly expanded inside the troubled waters of her heart. The Spirit Dragon's essence pressed in upon her, clear and sharp, severing the thread that linked her to the cruel voice slashing venom-laced chasms into her mind. Her gaze dropped to where a knife was clutched in her hand. Why was she holding a blade against her sister's throat? A strong hand snatched the knife out of her fingers and flung it aside. It thunked hard against the wall and hit the dirt with a thud. Blinking in confusion, she turned to see Grandmother awake and aware. Yasova grabbed Naiva's chin and forced her gaze to meet her own. "What is your name?" Grandmother demanded, examining her eyes. "I'm Naiva," she said indignantly, pulling back. "Have you already forgotten me?" "Of course I have not forgotten you. I cut you two out of my daughter's dead body with the knife you were holding to your sister's throat. Why did you not go up to the sanctuary, as I told you?" "There was someone on the path . . . Mevra . . . no . . . a dragon . . . that can't be . . ." She rubbed her eyes. Already the events just passed seemed hazy and unreal, like a story she'd heard years ago and could not quite recall. "He found you." Grandmother studied the cocoon that enclosed them. "The hedrons protect us from his touch." "The dragon who killed Ugin has returned." Her thoughts dredged into the sluggish deeps, hauling a name to the surface. "Nicol Bolas." "Yes. He uses his touch to manipulate the thoughts and emotions of others. Did he tell you to kill your twin?" Her head began to ache. When she squeezed her eyes shut, pale ghostly shapes floated as if trying to form into a coherent memory. "I don't remember . . . no, no, wait. I am supposed to bring you, Grandmother. He wants you." "You can't go out there! He'll kill you." "So we'll just stay safe in here until he grows bored and goes away." "Do you think he's as easily distracted as one of Atarka's broodlings? Because he is not. What do you think will happen if he does not get me?" "He threatened to destroy Tarkir. Can he do that?" "He killed Ugin by turning the minds of all the dragons against their own progenitor. He's a Planeswalker, ancient beyond measure. So yes, I must assume he can destroy Tarkir if he decides to do so." "What have I done?" Tears of shame ran down her cheeks. "I never meant to betray you, Grandmother." "You betrayed nothing. Yet for all I have tried to teach you girls, you have not listened well enough. Understand this. Any one of us may die at any time, and we will all die eventually. What matters is that we have woven threads to connect ourselves to the past so we do not forget our ancestors and what they have to teach us." "I'll go out and say I couldn't find you!" "He will kill you and turn his wrath upon Tarkir. If our people are to survive we must outwit him." She studied Baishya's closed eyes and serene expression. "Perhaps this is why Ugin summoned us." "Yes. Ugin is dead. He cannot speak to us in the ordinary way. He cannot even speak through the Whisper Mind." "How would Ugin know about that?" She raised an eyebrow. "He taught the skill to the shamans among our ancestors." "He must have learned mind-speaking from Bolas," Naiva muttered angrily. "Why should we trust the Spirit Dragon? He could have been manipulating us all this time too, couldn't he?" "He taught different secrets to the other tribes." "Yes. By sharing his secrets among the clans, no one clan would have more power than the others. What did Bolas offer you in exchange for bringing me to him?" She shrugged, too ashamed to reveal the words he had said, and the horrible things she had thought. "I didn't know I was so weak." "You are not weak. His power is vast. I intended to tell you and your sister the full story when you came of age, but it seems you have met your challenge now. So listen carefully. 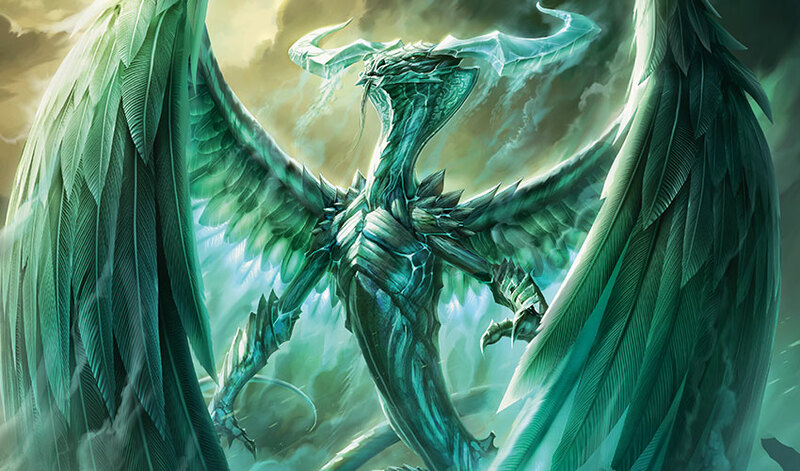 Years ago, before you were born, I helped Bolas track down Ugin because he promised me an end to dragons on Tarkir. To my shame, I even cast a spell that helped him turn the minds of the fledgling dragons against Ugin. It's important you know the truth, that I was promised the thing I wanted most—the end to all dragons—and I gave in to it. Only afterward did I discover the promise was a lie. Am I weak?" Baishya slumbered in her trance, untouched and tranquil. A surge of knotted envy twisted through Naiva's gut; she was glad Baishya was spared this terrible scene, yet why was her twin always the one to be spared the crude emotions and turmoil of life? "Ah. I see what he promised you. You resent your twin." "Yes. It's possible to both love and resent someone at the same time. But you two will always be bound, no matter what happens." Naiva scrubbed tears from her cheeks, hating how they made her feel. "You were holding her hand. Did you see the vision? The water and the popping bubbles?" "No, I did not. Your nature as twins must give you a window into whatever she is seeing." "What is she seeing, if Ugin is dead? Or is he just sleeping?" "His bones tell us he is dead. Yet his essence is contained within these hedrons. He is the soul of Tarkir. 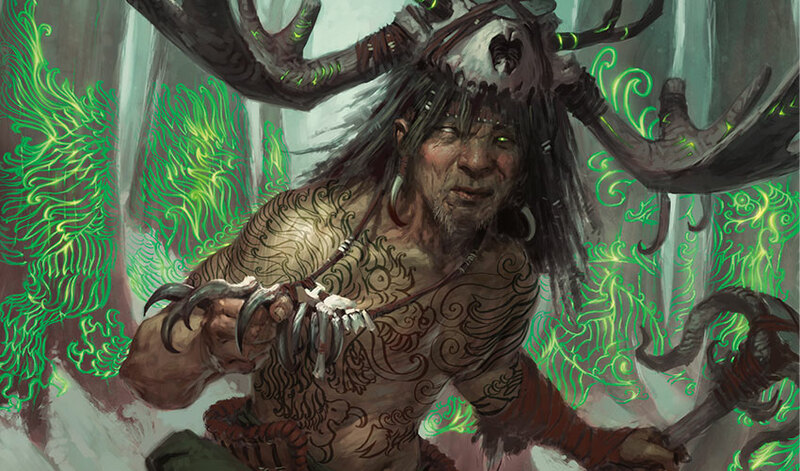 That must be why shamans can communicate with the part of him that is rooted in Tarkir, even if he is dead. Just as we have our ways of communicating with the ancestors." "Why does that matter to us? Why not let Bolas have what he wants so he'll go away?" "I do not believe Bolas can destroy the hedrons. Even if he can, if he destroys the hedrons, then the essence of Ugin will be obliterated. 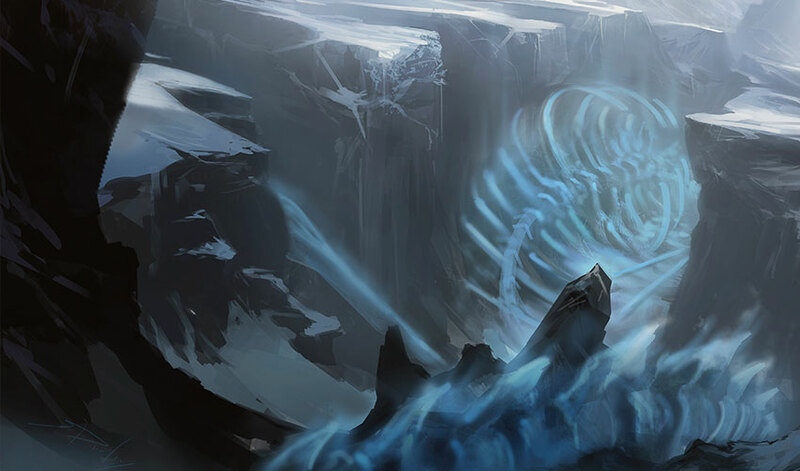 If his essence is destroyed, then even if the rock of Tarkir remains, it will no longer have a soul. That will be the death of our people and all of Tarkir. Even the dragons. As much as I hate the dragons, I love my people more. I do not want them to perish, even if it means saving the dragons." Naiva gazed on her sister's face. Baishya's expression was peaceful, but the rapid movements of her eyes gave away that some part of her mind was active. "The bubbles are memories," Naiva said. "Take Baishya's hand again. 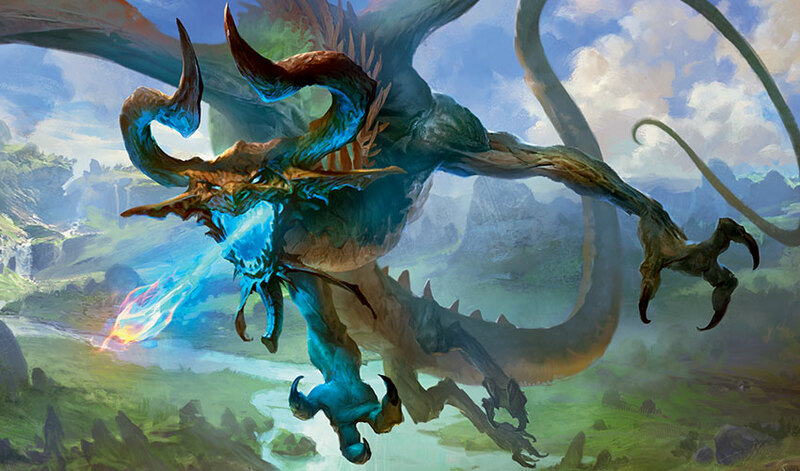 Find out what Ugin is trying to tell us." Naiva did resent Baishya and her magic and her strange surety of purpose, both dynamic and mysterious. For years, she'd felt as if people thought her lesser because she was only a hunter, and there were plenty of hunters, while whisperers were rare and thus precious. She'd pretended not to envy her. It was a relief to have the sour envy dragged into the open, even as repugnant as it was. Beneath the sheltering hedrons, no claw from Bolas's mind could rend her heart. However annoyed she often was at Bai, she didn't want to imagine the world without her in it. She smiled at her sister's face, twin to her own, the mirror she'd looked into for all of her life. After a decisive nod at Grandmother, she took hold of Baishya's hand. The world around her fell away as the glittering cliffs of Ugin's dormant mind bound her. The landscape is a silvery sheet of water as flat and reflective as a mirror extending to the horizon on all sides. Here and there, rocky islands like spires rise from the endless sea, each creating a perfect resting place on which to meditate. No wind stirs the air, yet glimmering, translucent globes float like bubbles caught in a breeze that touches nothing else. One of these globes drifts close, and closer yet to the dreaming shadow of the girl asleep atop the waters. When its frail surface touches the edge of her misty form, it pops. The thin sphere of liquid spills memory into the shadow of her mind. A dragon hovers over the still waters, staring into its reflection, a mirror which looks back on itself. The reflection is so complete in every detail that it might be the original dragon looking into a mirroring sea, and the dragon floating aloft might be its reflection, complete in every detail. Although this realm is perfectly created for meditation, although he has rested here for long periods to contemplate mystery and eternity, Ugin cannot calm his turbulent thoughts now. He'd been so sure Nicol would be overjoyed to see him, would want him to share the wondrous details of his fascinating journeys through the planes. But he'd judged wrong. Or maybe he had only misjudged himself. He should never have left the birth mountain, yet he hadn't fled Dominaria on purpose. The spark had taken him unawares. It had flung him outward like a fish hooked and hauled out of the water, the only home it had ever known, to be thrown onto unfamiliar shores. He hadn't understood what happened until he'd landed on Tarkir, and then the sense of belonging and connection he'd felt for Tarkir had kept him preoccupied for far too long. Was he at fault? Or was it just the way things had fallen out? Maybe if he'd stayed, events would have unfolded in the same way. Nicol had succumbed to the worst in himself, and now, he intended to inflict his power and anger upon all of Dominaria. Regret for what Dominaria would suffer as the dragons went to war with each other battled with the relief that Nicol was stuck there. Unable to planeswalk, he could never impose his terrible vision of law and justice on the rest of the planes. That was something, at least. A bright flash like the rising of a second sun spills a splash of gold across the still waters. A howl of rage sunders the peaceful silence. A huge body falls like a stone flung out of the heavens. 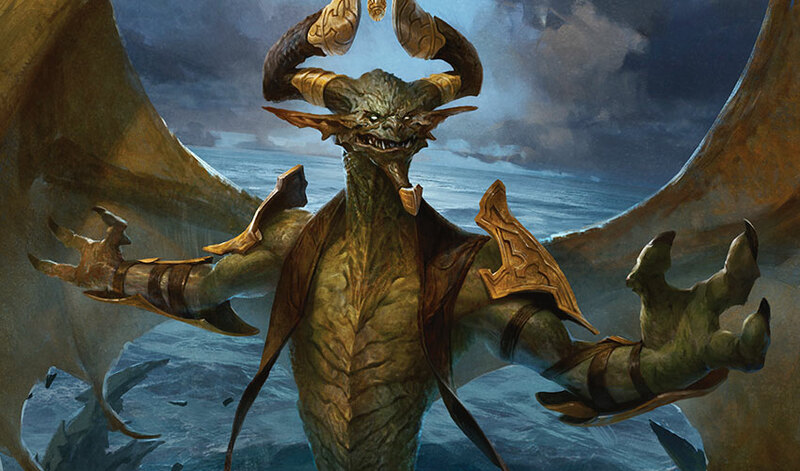 Just before he hits the water, Nicol Bolas spreads his wings and rises. He shines as brightly as the sun, and ire is his color. With a howl on the wind and a searing blast of fire, he dives murderously toward his brother. 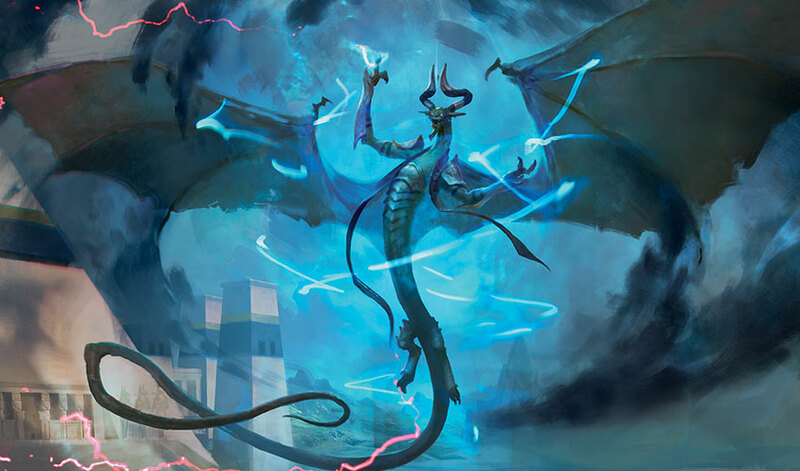 Ugin stares, bewildered by the abrupt attack, thinking at first it might be an excess of joyful celebration. Only when the stinging sparks of Nicol's fire wash over his head, blistering his eyes, does he shear to one side. His right wing skims the water's surface, cutting a gash through his own reflection. He rights himself, leveling out, and races away toward the archipelago of islets. Nicol pursues. His fury grants him a strength and speed that weary, sorrow-ridden Ugin lacks. Fire burns at Ugin's rear claws. A wash of caustic magic like a cloud of venom numbs his hindquarters. He dodges in among the islets. He's explored here often, rested upon these craggy outcrops under the silvery sky and its placid moons. He knows just where to twist and turn, leaving Nicol to overshoot with a bellow of anger and clumsily turn around. But Nicol figures out the game quickly. He changes tactics, ascending so he can spot Ugin from above with no rocky obstacles in his path. Ugin's shout carves waves into the water as if it has become a powerful wind. "Nicol! What do you mean by attacking me?" "You hoarded the knowledge of the planes to yourself. You lied to me. You taunted me with a vision of the treasure you had discovered, and then you spitefully abandoned me." "I came back for you—"
"You never came back for me. You only returned to mock me because you couldn't be content unless you were sure I would suffer for eternity knowing you had won a prize I could never touch." "That's not true. I didn't know—"
Nicol plunges toward the water, claws out. As Ugin dodges, he raises a dense fog off the water to conceal his movement. Nicol drags a furrow through the water, and waves ripple in great swells outward then slowly quiet as Ugin considers what to do. Wingbeats carry Nicol aloft again. He begins to circle as the haze slowly dissipates. "Ugin! Don't be too much of a coward to admit your treachery. I'll have my revenge either way." 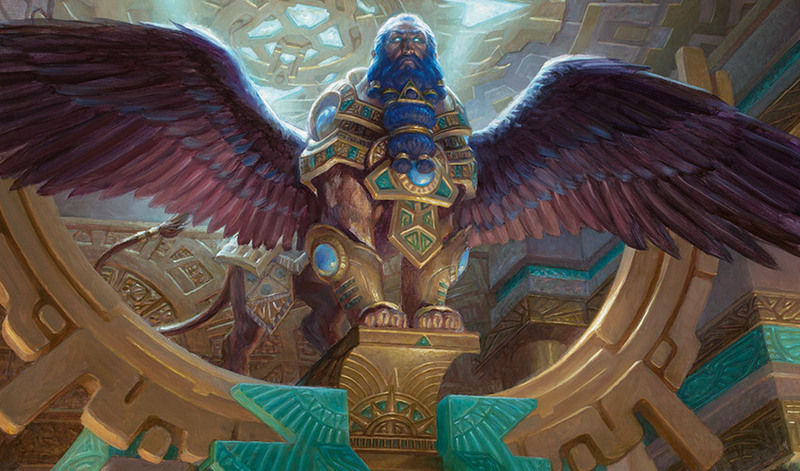 Ugin has traveled through the Multiverse with the greatest curiosity, observing as he goes, recalling the lessons of Te Ju Ki and the example of Chromium Rhuell. He has learned the magic of discovery, of investigation, of discernment, and even of defense. What he has taken no time to learn is the magic of attack and assault. He would always prefer to talk rather than fight, to build rather than tear down. He cannot win by copying Nicol's aggression. Only shrewdness, and a bit of dragon trickery, can save him now. "How did you gain the spark?" he asks, because knowing why may help him understand what Nicol has become. "The spark you meant to withhold from me?" "I could never have given you the spark. I did not seek it. It came to me unbidden." "So you claim, but I don't believe you. And now the spark is mine. I will not share it with you. I will not share the planes with an enemy who betrayed me." "I am not your enemy—"
Nicol dives again, silent and determined. Ugin takes the only path left open to him, even if it means Nicol will brand him a weakling and a coward for it. He walks out of the Meditation Realm and through the darkness to drop into storm-wracked Zendikar. Within the tumult of clouds, he glides on the storm winds, sure he can at least catch his breath and think about what to do next, how to escape until Nicol calms down, how to negotiate, how to convince his twin that it was ignorance and not malice. But Nicol is right on his tail, bursting into the darkness in a flash of golden light. Again, Ugin walks, and again, seeking a plane that will conceal him just for a short while. From bustling Kephalai to growing Ravnica and on and on, he flees with Nicol breathing down his neck, never slackening in his pursuit. It's growing harder for Ugin to see as his blistered eyes develop pustules, as the numbness creeps up his extremities from the magic Nicol wields. He'll heal in time. Dragons have that gift. But he cannot rest, he cannot eat, he can do nothing but run. As he races to stay ahead of Nicol's unquenchable animosity, he begins to feel his wounds eating away at his strength. Yearning flashes: he could return to Tarkir, hide where his soul feels at peace, where the world welcomes him and wishes to heal him. But then Tarkir itself becomes vulnerable to Nicol's rage. He would rather die than let Tarkir be wantonly destroyed, and if anyone would commit such a vile, remorseless act, Bolas would. As the thought washes over him, he sees in his mind's eye the still waters of the Meditation Realm. He sees himself reflected in that liquid mirror, down to every detail. What is the Meditation Realm, really? It's a mystery he has yet to fathom. Te Ju Ki's wise words sweep over him as a breath of warm wind, with a perfume that calms his tumultuously beating hearts. My essence will continue to exist in other forms. All things end. Sometimes that is not the same as dying. He knows what he must do. Nicol will never stop pursuing him, not unless he thinks his twin is dead. He planeswalks back to the Meditation Realm, where he waits, floating above the still waters, or perhaps his reflection floats, looking down on himself. He is exhausted yet buoyed up by new strength, by a surety that he will reject what Nicol has become. 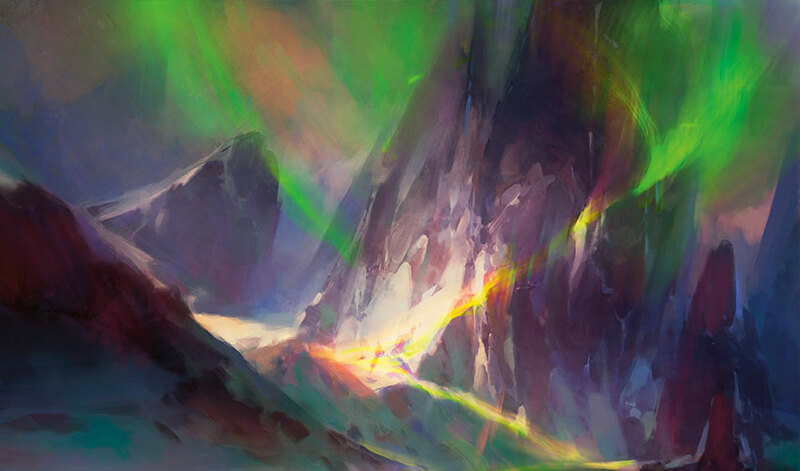 In a burst of light, Nicol appears high in the lustrous sky. He dives, all teeth and claw. In a flash of comprehension, Ugin sees how malevolence is threaded through his twin's entire being. Maybe it was only a tiny seed within him, long ago; maybe Ugin leaving allowed it to thrive and flourish. 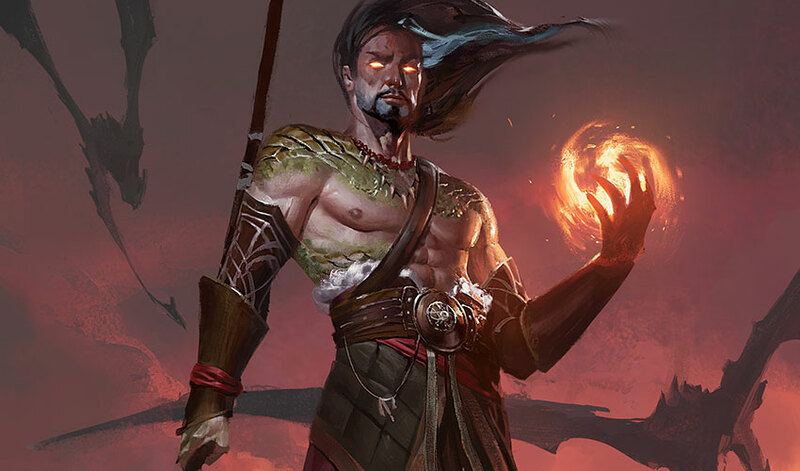 The brother he was born with, whom he flew with—Nicol—has been entirely devoured by Bolas, the name Nicol gave himself because he could only measure himself against others. Maybe nothing Ugin could have done would have changed this outcome. But he regrets that it has come to this. With a sigh, Ugin accepts his death. He lets go. Bolas roars in triumph as his magic billows in a steaming cloud around his hated foe, as his claws slice deep into his enemy's hotly beating hearts, as his teeth slash his rival's unprotected throat. With a mighty splash, Ugin falls into the still waters. The impact resounds like thunder. Monstrous waves rise from the displacement and sweep across the craggy islets, crashing and destroying the ancient rocks. The disturbance washes far beyond the bounds of the Meditation Realm, spilling into the fathomless dark cavity whose infinite web connects the planes themselves. The sea empties, exposing the rock of the seabed like bones left to bleach in the sun. Dragged by the sheer shocking force of the cataclysm, Bolas flares like a sun and vanishes, torn away to the plane of his birth, falling to the islands of Madara. Where once the realm was filled with the silence of tranquility, now it is vacant. It has become a wilderness of rock, barren and wrecked, all its serenity drained away into the interstices of the blind eternities, a chasm that can never be filled. Nothing moves because nothing remains. A moment passes. A year. A generation. Or maybe, no time at all. A pale sheet of liquid trickles up as out of nowhere, returning from the unseen and untouchable web of darkness. With eerie silence, it inexorably rises, refilling the realm with its silvery waters. When the waters cease rising, they grow still, and in that still mirror waits the reflection of the dragon. He inhales, pulling the waters into himself. They curl and froth into every crevice and wrinkle and scale and indentation until his horns sparkle and his claws gleam and his eyes shine with magic. Is he flesh and bone, or is he spirit and magic? Does it matter? The dragon floats above the dry seabed beneath the luminous sky. He sweeps his gaze across the fractured realm and its barren, broken landscape. This manner of destruction is the promise Bolas has made; it is what Bolas wants for anything or anyone who defies him. Someone must stand against him, someone who knows him well enough to defeat him. And Bolas is not the only threat against the Multiverse. Ugin has a lot to do if he means to protect the planes. On a ripple of invisible flame, he departs. The dry seabed lies quiescent, empty. Bubbles begin to swell up one by one from the rock itself. One by one, they pop. The liquid of their surface slides into the hollows and depressions on the empty seabed, and slowly—oh-so slowly—the Meditation Realm begins to fill up again with lost memories. The water waits motionless, calm, yet expectant, almost aware. Another globe spins up to the shadow of the sleeping girl and pops. In the Meditation Realm, the god-emperor perches atop an outcropping of rock amid the ruins of a once handsome temple whose columns and roof were dashed to the ground at the time of the cataclysm. To Bolas, these marks of devastation are marks of victory. His wings, outspread, cast a shadow over the waters. He can't quite recall exactly where Ugin fell, but fall he did, and now the opaque waters have become his grave. This, the site of his greatest triumph, is a fitting place for him to ruminate over his plans. To give himself a focal point on which to center his meditation, he chooses a spot at the center of a vast span where no islands break the surface. Here, he erects two gigantic curved horns so they emerge from the waters as if a gargantuan dragon lies sleeping beneath, body hidden from sight. When he is done, the sky gleams with a contentment that matches his own. Yet a nub of discontent chafes against his satisfaction. Shred by shred, the mask of victory peels apart to reveal the seed of rancor beneath. Not all of Dominaria cowers beneath his rule. He has enemies unwise enough to believe they can defeat him. Besides that, so many planes await his presence. How is he to grace them all with his magnificence? How is he to prove that he is not the least, that he was first, best, always? The challenge arises before him like the cliffs of a towering mountain, like the vast immensity of a planes-spanning chasm, like the teeming swords and spears of a world-slaughtering army. The insatiable maw of his ambition will devour them all. In a great city of glass and stone, a winged creature with the bearded face of a man and the graceful paws of a big cat greets the Spirit Dragon. "Ugin, my friend, welcome to my newest home. What brings you to this plane?" "When last we met, we discussed our common foe. Every world is in danger, as long as our enemy is free and whole. That is why I am here. I have devised a plan to rid the Multiverse of his influence, but I cannot do it without you." "To capture him and trap him, you will first have to lure him to a specific location." "I will lure him to Tarkir." "Is the plane of Tarkir not your soul's home? 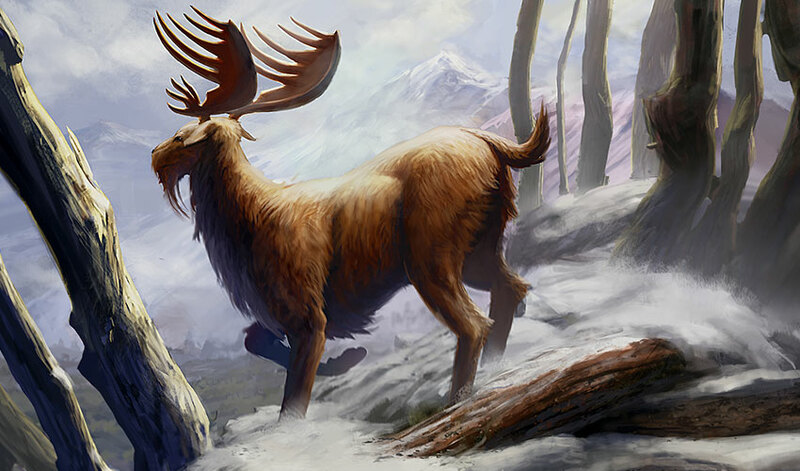 Does such a scheme not place Tarkir itself in danger?" "That is why he will come and not suspect anything. He believes I would never risk Tarkir." The Spirit Dragon soars amid a tempest, thunderclouds surging around him as the winds boom and bluster. He is waiting. A flash of light heralds the arrival of Nicol Bolas, his curved horns now embellished with a gem floating between them like a third eye that sees only what he lacks, what he does not yet possess. The two elder dragons face off, circling as the storm creates a funnel of raging winds around them. They are well-matched, one armed with cunning and the other with wisdom. The Spirit Dragon knows it is impossible to kill Bolas outright. That is why he has devised this elaborate plan with his ally: their only chance is to trap their foe so he can never planeswalk again. To do that, he must hold Bolas here on Tarkir until the magical device can be activated. With a roar, he wakens the force of Tarkir's soul. Dragons pour in from all across the plane in answer to Ugin's call. Even with this advantage in numbers, the Spirit Dragon does not attack. This is all a feint, to lure in Bolas, to make him forget to be cautious. Yet even the best laid plans may crack. Bolas turns the dragons of Tarkir against their own progenitor, and when his enemy has been weakened by their attacks, he breaks Ugin's body with a deathblow. The Spirit Dragon plummets to the ground. The force of his impacts smashes a chasm into the rock that alters the landscape. The reverberations of the destruction will roll on for years and generations and millennia throughout the Multiverse. Victorious, Bolas vanishes in a burst of light. In a great city of glass and stone, a winged creature with the bearded face of a man and the graceful paws of a big cat greets the Spirit Dragon. It is the same memory, repeated exactly. The hunter knows when she's caught her prey. A dark shape cuts across the shadow of the sleeping girl. A five-fingered hand bent in the shape of a claw reaches into the shadow of the girl and yanks her out of the vision. "Ouch! Let go!" Her sister shook off Naiva's hand and rubbed at her shoulder. "It's like you scratched my heart!" "Did you see it?" Naiva demanded. Baishya rubbed her face, shook herself, and let out a sigh. "I saw into an ocean of memories. Did you see it too, Nai?" Grandmother was still seated cross-legged, watching intently. "Tell me." Speaking in a rush, one picking up when the other paused to catch her breath, the two girls described what they'd seen. When they finished, Grandmother considered in silence for a few breaths, turning over what they'd said. Then she nodded in her decisive way. "The Spirit Dragon has not forgotten Tarkir. We have a chance to deflect Bolas. One desperate chance. I will take it." "Do you mean to surrender yourself to him?" Naiva demanded. "But he already manipulated you once." "Yes, so I am prepared this time. I won't be as vulnerable." "What if he kills you?" Baishya asked, voice cracking as she clutched at her grandmother's hand. "I don't fear dying. I helped bring this about, so it's proper I help end it." Naiva pulled her twin's hand away from their grandmother. "You'll stay in here, Bai. You have to stay safe because who else can communicate with the Spirit Dragon?" "No," said Grandmother. "Bolas got his claws into you, Naiva. I do not blame you for it, but Baishya will wear your mantle and go out in your place." "What difference will that make? If he invades her mind or your mind, he'll see it's not me." "Maybe. But he's arrogant. And he's never seen Baishya, so he may not believe he needs to probe any deeper since he surely believes he controls you. It's a chance we have to take." "I can do it, Nai," said Baishya. "The second thing a whisperer learns is how to deflect magic." "He's too powerful. He'll kill you both." "She need only deflect his touch long enough to sow a seed of doubt, just as her wearing your mantle will ease his suspicion," said Grandmother. "And the hedron shield will offer a little protection, like an extension of a whisperer's headdress," added Baishya. "Yes," agreed Grandmother. "Now do as I say." Naiva took in a calming breath and released it with a hiss blended of frustration, anger, fear, and resolve. The girls swapped mantles. Grandmother examined them. "It's fortunate you wear your hair the same." "Wait." Naiva pulled off the necklace she wore, threaded to the tooth of a bear she'd killed when she was sixteen, and draped it over Baishya's neck. Then she hugged her sister. Fear had lodged beneath her ribs like a spear point, but now that the decision was made, her mind could fix on the hunt. She handed over her spear. Grandmother and Baishya crawled out through the low opening, leaving her behind in the tent-sized space entirely enclosed by the walls of the rock cocoon. Their footsteps scraped on the dirt as they walked forward. She could not bear waiting in ignorance, so she knelt beside the opening, adjusting her position so she could peek out without being seen from outside. Grandmother and Baishya stood in the shadow of the dragon. One huff of fire, one swipe of claw, one blast of magic would easily kill them, yet they did not cringe or grovel. No listener could mistake the gloating rumble of the dragon's words. "Yasova Dragonclaw. You have served me well." "And you, Nicol Bolas, you have acted exactly as the Spirit Dragon knew you would." Grandmother flung her spear of words without hesitation. "You think you're the deceiver, but he deceived you." The shadow rippled as the dragon moved restlessly. In a sharper tone, he said, "What do you mean?" "You came back to see if he was really dead." Sparks flashed along the ground in a warning cast of deadly rain. "Of course he is dead. I killed him." "The last time you thought you killed him, he tricked you. I am here to tell you he has tricked you again." "Why do you lie?" the dragon cried. "I saw him fall! I saw his body hit the ground. Your own granddaughter confirmed it. Little Naiva, is it not true? Ugin is dead!" "If you're so sure Ugin is dead, why did you return to Tarkir?" said Baishya in her most scornful voice, the one that usually annoyed Naiva out of all reason. 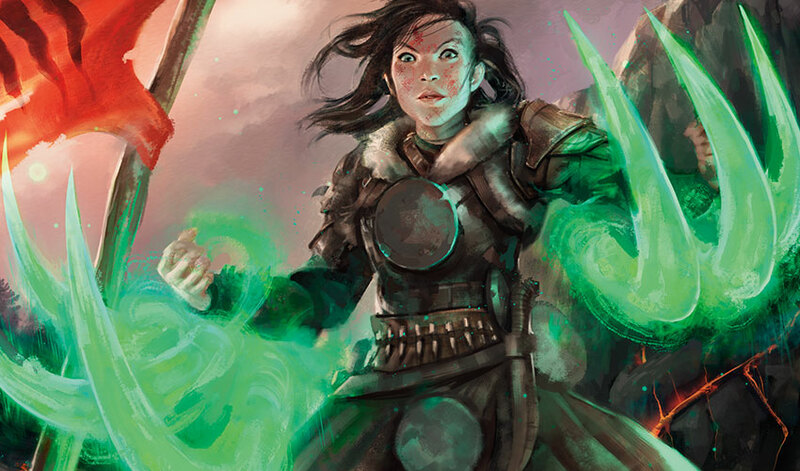 Hearing it turned on a stupendously powerful Planeswalker, who could obliterate grandmother and granddaughter with the merest touch of magic, made her appreciate her twin's quiet but sharp courage, so different from her own brash boldness. Yet who was the bold one now? Not Naiva, hiding inside the cave-like space within a hedron while others faced down the dragon. Baishya went on in the same goading tone. "You can't admit you came back to make sure he was really dead this time, after he tricked you last time." The shadow ripped away, vanishing as the dragon flew. Naiva dropped flat on the ground, craning her neck so she could see the sky and the canyon walls. His physical form had vanished from view, but his magic erupted in a crackling display of lightning high above followed by four massive booms of thunder. A magical wind blasted down from on high, forcing Grandmother and Baishya to their knees. The hedrons shuddered beneath the gale. The wind was so strong that the scale-like oval of thin rock they'd used before to cover the opening was slapped sideways to block Naiva's view, leaving only a finger's-width gap to let in light and air. As suddenly as it rose, the gusting wind died. A darkness spread over the ground with the great dragon's return. Though she could not see him, every fiber of her being felt his massive, malevolent presence like a claw at her throat. She tried to take in a breath but choked instead on a venomous and consuming terror. She would lose them both. If she ran out now, she could strike at him, distract him while the other two ran for the safety of the hedrons. She'd be the bold one, the fierce hunter, just as she'd always known should be her rightful place in the tribe. She pushed up into a crouch, readying to shove the slab aside and cast herself against the foe. Instead, she paused, forcing herself to breathe more slowly. Maybe Grandmother feared that even with the protection of the hedrons, Naiva was too weak to be trusted. Or maybe the fear that her beloved grandmother didn't value her was her own weakness speaking, a foe only she could defeat. She had to trust the woman who had raised her, who had saved the Temur people from Atarka's wrath. Hands clenched, she focused her thoughts. However hard it was to do so, she had to accept that her part in today's hunt was not to throw the spear but to remain concealed. As the great dragon exhaled in anger, a wash of stinging heat swirled through the narrow crack and into the tiny chamber beneath the hedrons. "Do not toy with me. I can kill you both in an eye blink. After that I will jubilantly devastate Tarkir until not even the slightest bug crawls upon its blighted surface." "Then get on with it instead of boasting," replied Grandmother in her usual brusque tone. "Kill us if you will, raze and ruin Tarkir if you choose, because it makes no difference to Ugin's plan. There will always be a greater power than the one you wield." "I am the greatest power!" His voice boomed, cracking rocks. "As you'll soon see, Yasova Dragonclaw, when your own beloved granddaughter drives a knife into your heart. Do it, Naiva. I command you! Kill her, and I will grant you all that you desire, dominion over this world to become your private hunting grounds. You will be first and best, always." The words drove into Naiva's heart as a secret and poisonous wish. First and best, always. Grandmother should have been training her to become leader after her instead of wasting her time on Baishya and the other shamans. Their path was dead, like Ugin. It ought to be dead, and she could kill it once and for all. She need only shove aside the slab of rock and crawl out. Baishya had never been as physically strong, so it would be easy to wrestle the knife from her sister's hand. She would press the knife against Grandmother's throat, feel the thunder of her pulse, the vulnerability of her beating heart. The great dragon sucked in an expectant breath. His pleasure in watching love turn to hate, loyalty into betrayal, spread like a devouring heat over the scene. Her fingers touched the grainy rock shield, ready to shove it aside. Baishya's voice slapped her like a chilling wind. "Maybe I don't want to hunt. Maybe nothing you offer tempts me, because from everything I've heard, you're stuck in the past, circling around and around your rivalry with Ugin—"
"You're about to be," Grandmother interrupted curtly. Naiva pulled her hand back, teeth gritted as she struggled against a ferocious desire to charge forward. For the plan to work, she had to stay concealed. She had to. "You're standing right where the hedrons concentrate magical force into a nexus of great power," Grandmother went on. "The Immortal Sun is pointed here, at this very spot on Tarkir. It will drag you to another plane and, there, trap you for all eternity. Why do you think we've kept you talking all this time? So it can be activated, and you'll never planeswalk again." If he was torn from Tarkir, he could not make her first and best among hunters. Only she could stop them, and only then could she get what she had always wanted, what she deserved. Again, she pressed a hand, fingers spread, against the slab's smooth surface, ready to shove it aside. A cooling pulse of calm raced down her arm. Its steadying vibration bled a harsh light into the depths of her soul. It was a child's petty, selfish desire that drove her. She was better than this. She would be better than this. Shaking, she closed her hand into a fist and tucked it against her throat as she swallowed the rancid flavor of her resentment and envy. Outside, as if in reaction to that unseen movement, Grandmother inhaled audibly, as if in anticipation and suspense. "Ah! Listen! Do you hear the artifact's hum, Naiva?" "I hear it!" cried Baishya in the falsest tone Naiva had ever heard, but how was the dragon to know that when he couldn't even tell the twins apart? "Just as Ugin said it would happen! Look up above! Do you see the light? A second sun in the heavens!" A roar of fury rattled the hedrons. Shaken loose, the scale-like slab of rock tilted, teetered, and fell sideways to unblock the opening just as the vast shadow lifted. Boulders crashed down from the rim onto the open ground where Grandmother and Baishya stood. An avalanche of rock and ice pummeled the indestructible hedrons, splintering into shards that flew through the gap against Naiva's face to gash her cheeks. She tugged her twin's mantle over her head to protect herself. Dust boiled up to obscure the scene beyond until she could see nothing excepting a dizzying dark whirlwind that filled the world. He had struck, and those she loved most would be obliterated, and after them, all of Tarkir . . . and her with it. The light outside changed color with a harsh golden flash that blinded her. Air swirled out of the opening, pulling the choking squall of dust back outside. Somehow, she wasn't dead yet. Her heart still beat. Slowly, in ominous silence, the particles settled. Her lips were annoyingly filthy, coated with a foul-tasting grit. The silence weighed horribly, like the end of all hope, the sick regret that it had taken so little for the dragon to manipulate her. Grandmother had been right about her weakness. Yet still her heart beat. She had resisted Bolas's magic and stayed inside the hedron. Tarkir wasn't ravaged and broken. Cautiously, she ducked down to peer out the opening. Snow melted off the angled hedrons by the heat dripped onto the ground in little plops and ticks. She rubbed her burning eyes as the world's shadows and brightness gradually came back into view. Scraping her hands, she crawled outside over a sliding heap of broken rocks into a clearing half-filled with the deadly debris. The canyon walls rose solidly above her, watching over the untouched hedrons. The sky gleamed a brilliant blue, the sun blazing high overhead in magnificent indifference just as it did every sunny day. The dragon had vanished. But she was alone. Grandmother had saved Tarkir, but at the cost of her and Baishya's lives. Staggered, she rocked backward, hitting the hedron wall. Her legs gave out and, helpless to stop herself, she slid to the ground. What had she done, stupidly cowering inside the hedron? Why hadn't she acted, flung herself at the dragon? But she shook off the useless thoughts. The chance of death had been part of the plan. It wouldn't have worked otherwise. Yet she could not breathe, thinking of how she would have to walk forward through the world without her twin beside her. Her heart was ripped in two, but somehow, she had to stand up and find the others. Just not yet. She couldn't find the strength quite yet. A faint scuff broke the silence. It sounded exactly like a foot shifting on the dirt, but there was no one but her in the clearing, just a heap of huge rocks. Someone coughed. Jolted by adrenalin, she jumped up with knife in hand. A big boulder shifted with a great, grinding rumble. It crunched sideways to reveal Grandmother and Baishya standing, alive, in a tiny pocket of space made by several boulders packed together. A powerful glow of magic faded from her twin's outstretched arms as Baishya slumped forward. Scarcely able to breathe for the dust in her lungs and the hope choking her heart, Naiva scrambled recklessly over to them, scrabbling and sliding on loose rock until she reached the patch of untouched ground. She caught her twin around the back, holding her up. Her twin was warm. Breathing. "You used your magic to hold off the rocks!" she cried, because it was the only thing she could think of to say. Tears cut trails down her dust-smeared, blood-streaked face. "Is he gone?" Baishya whispered, leaning trustingly against her sister. "He's gone," said Grandmother. "He could not take the chance it was a bluff." "I was sure he'd killed you!" Naiva started to shake as the full import hit her. Baishya: dead. But not dead. She was alive. They had survived. "It was a risk," agreed Grandmother. "But he knew that if I was telling the truth, then even taking the time to fly down to swat us with his own claws might have been too late for him. I believe he was sure the avalanche created by his departure would kill us." "And you were telling the truth in a way," said Baishya. "There was a plot to trap Bolas using the Immortal Sun. Except Ugin died before he could set it in motion." "Is the Spirit Dragon really dead?" Naiva studied the unmarked surface of the hedrons, thinking of the vivid fullness of the memories the girls had shared. How was it possible that recollection could pass from the dead to the living so strongly? "All things end," said Grandmother. "Sometimes that is not the same as dying." A crack of sound brought their heads up. Loosened rock broke off the lower canyon wall and slid noisily down the hedrons to cover the opening into the chamber where she'd hidden. More snaps and pops crackled around them, echoing between the high cliffs. "We need to get out of here," said Grandmother. They carefully picked their way up out of the debris field to where the path emerged from the avalanche zone, pausing there to again catch their breath. A slap of running footsteps clapped down from above. Naiva grabbed her spear from her sister and set into a crouch, spear raised, then relaxed as their companions rushed into view. Tae Jin ran in the lead, his ghostfire blade blazing with a formidable light. "Quench that blade!" snapped Grandmother. "It's a flag that will bring every dragon down upon us." Obedient to his elder's command, the young man drew the magic back inside himself, and the blade dissolved like mist beneath the summer sun. Then he looked at Baishya, who was wearing Naiva's mantle and necklace. He nodded politely at her and hastened over to Naiva. "Are you all right, Naiva?" he asked with an intent gaze that made her flush warmly. "You must have faced the dragon alone!" "Not alone, because I always have my twin. But how did you know it was me? We switched mantles." "Yes, so I see. I suppose you had some hunter's reason for it." His smile wrinkled the skin at the edges of his eyes, like a glimpse into the elder he might one day become if Ojutai or his broodlings did not hunt him down and kill him for the crime of being a ghostfire warrior. "It's true when we first met I thought you two looked exactly alike. But now we've walked together for a few days. I wouldn't mistake you for your sister ever again." "Why is your face so red, Nai? Too much sun?" demanded Baishya with a smirk. She winked at Tae Jin as she would wink at a cousin, and he blushed too, but he did not move away from Naiva. Grandmother looked from one to the other, no emotion on her face, before turning to her four loyal hunters. 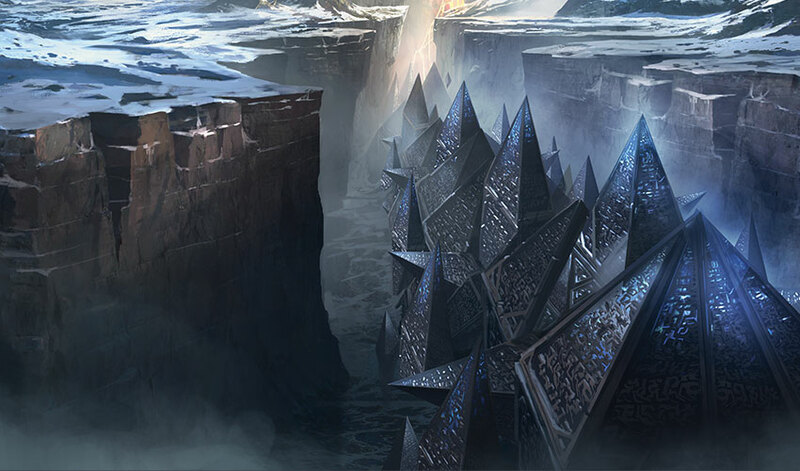 Mattak, Oiyan, Rakhan, and Sorya stared over the debris that buried the open space and the hedron's opening, the only visible residue of a titanic battle won with words and trickery instead of might and blades. "Was it an illusion?" Mattak asked. "I've never seen a dragon so huge, and so magnificent." "Magnificent indeed," said Grandmother. "I hope the threat of Ugin's trap means we never see him again." "If only we could have persuaded him to kill the dragonlords before he departed," Naiva muttered. "The path of might-have-beens leads only to misery," said Grandmother. "A creature like that does not do favors for others, only for himself. Furthermore, as I know too well myself, when you try to shape selfish dreams into reality, it is the consequences you do not expect that hit you hardest. We are left with what we already had. I'll accept that gratefully. Where is Fec?" The uneven sound of a final set of footfalls was her answer. The orc arrived last of all, holding a fine chisel in one hand and a horn in the other, his swords sheathed in their scabbard across his back. "Were you going to attack the dragon with the chisel or the horn?" Grandmother asked with a sardonic lift of an eyebrow. "It was immediately obvious to me that such a dragon could not be defeated by our feeble magic," Fec said. "So I thought surprise might work where weapons would not." "Yet the dragon is gone, and you are alive," Fec added. "I'll tell you the story when we're resting beneath the overhang, out of sight of roaming dragons. Atarka and Ojutai will send broodlings to investigate today's strange events." Grandmother started up the path. "Girls! Come along!" Side by side they hurried after Grandmother. Naiva was almost too delirious with joy to think, yet too brimful of energy to remain silent. So, she spoke the first random question that flew into her mind. "What about the liver and hearts from the broodling? Will we retrieve them on our way home?" Just as Naiva started to ask what the organs would be used for, Baishya interrupted breathlessly. "Do you think I could learn to planeswalk? Or is it a magic reserved only for dragons?" "Not only for dragons, since I met a Planeswalker before you were born. He seemed in most ways as human as you or me, and was especially disrespectful and a bit tedious when he whined and begged," said Grandmother with a cough of displeasure. But it was more than a cough. She was growing out of breath as they climbed the steep path toward the rim of the canyon and had to lean heavily on her spear when she had never needed its aid before. Where once she had seemed ageless, the difficult journey and the confrontation with the powerful Bolas had exhausted her. Maybe she would not die this year, or even in five years, but mortality had its claws in her. The knowledge sunk its weight into Navia's heart like a stone. Yet now she also understood that Yasova Dragonclaw did not fear death for herself, only the obliteration of her people. "It's time for you two girls to understand your own responsibilities and how much rests on the shoulders of you young ones," Grandmother went on. "The Temur clan must not die, even if it must sleep, like Ugin, hidden until it may waken again. It can only waken if there are memories remaining to guide it." "How can carvings be enough?" Naiva asked. "Enough for what? Nothing can remain the same as it was in the days of my youth, or yours, once you are old. Change is master of us all." They reached the overhang. Mattak and Oiyan went back outside to stand sentry, while Rakhan and Sorya set a pot to boil over a fire. Grandmother sat wearily on a stone, letting her granddaughters fuss about her in a way she would never have done in the past, when she took care of them, raising them from infants to the edge of adulthood. They took off her mantle, tidied her hair, wiped dirt and sweat off her face, and settled her with a hot tisane to warm her hands and strengthen her lungs. Tae Jin gave Naiva a look. "What can I do?" he asked softly. Grandmother gestured, indicating the young man should sit beside her. Fec settled across the fire from them and set out a neat row of carving implements on a rock bench. He began working on the horn he'd been carrying, one that would be added to the scrimshaw collection hidden in the caves. "Tae Jin, you are welcome to stay with us, if that is what you wish," said Grandmother. "I must return to my master. He has more to teach me. Afterward, it will be my responsibility to pass on my knowledge to those who come after me, so the Jeskai Way does not die." He looked at Naiva, sighed, and gave a slight shake of his head. "This is my duty, no matter what else I might wish for." "Yes, of course it is," said Grandmother briskly as Naiva wrung her hands but said nothing. In the harsh world of the clans, duty always came first. 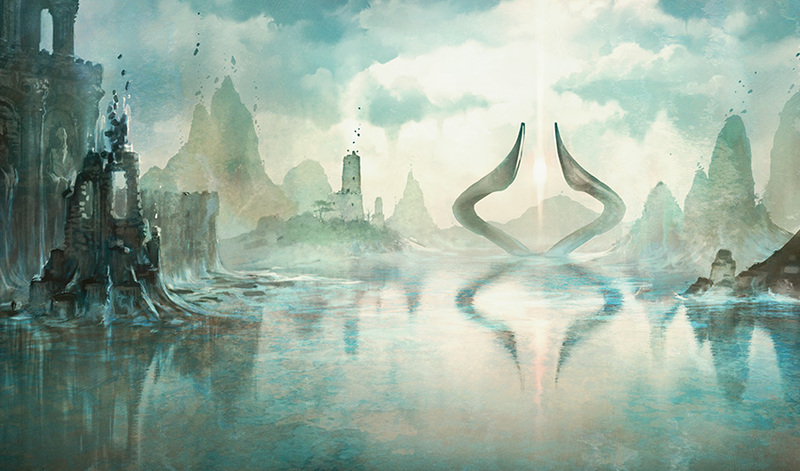 "Ugin sent you here with a story to tell us with the hope we could use it to drive Bolas away from Tarkir forever. But that isn't the only reason Ugin sent you. The Spirit Dragon understood the lessons taught him by the old wise woman Te Ju Ki. This isn't just about Ugin, and Bolas. This is about the Temur, and the Jeskai, about all the clans on Tarkir. I remember them all, while you young ones never knew that world. Our dragonlords mean to obliterate the knowledge of all that came before. This is why we must do everything we can to safeguard the heart of our ancestors." She extended an arm. Fec placed the horn in it. Turning the horn, she displayed a beautiful carving, just begun, of two girls standing on a steep mountainside. "Someday, perhaps long ahead in the unwritten now, people will be born who will find this story, and it will transform their understanding of the world." She returned the horn to Fec. He set back to work with easy concentration and consummate skill. Baishya nudged Naiva and whispered, "I told you Grandmother took him into the tribe for a reason." "I must return to Ayagor and hunt for Atarka. Above all else, she must believe she has killed all the whisperers. She must never suspect the existence of the Whisper Mind. We do what we must to survive. For now, you girls will stay here." "But the opening to the hedrons is blocked," Naiva objected. "With care, it can be dug free. Baishya, you must see if Ugin will continue to communicate with you through the ocean of memories. Fec will record whatever you see. All that he carves will be stored here with the rest of our hidden stories. Naiva will hunt for you, and keep you safe." "Will we ever be safe?" Naiva asked. "Safe merely means the last dragon we've seen is flying away from us. As for Bolas, I hope he will consider it too risky to return to Tarkir." "You lied to him," Naiva added. "What if his story is the true one, and Ugin's story the lie meant to manipulate us into saving his essence from Bolas's revenge?" "We will never know." She bent her gaze on Tae Jin, who was sitting as still and silent as the waters of the Meditation Realm the twins had wandered. "I know you must return to your master. But let me ask you to please remain here for some months at least. I would like you to recite Ugin's story once again to Fec so it can be carved and preserved in more than one place. We people of the clans must work together to save ourselves. That is the only way. That is also Ugin's message to us." Naiva held her breath as Tae Jin met Grandmother's stern gaze. But he smiled and, with a swift, shy glance at her, nodded. "Yes. I will stay here for a while." A blaze of elation jolted her. She didn't mean to smile, yet she couldn't stop the big grin that creased her face. Baishya snorted and kicked Naiva in the shins. Tae Jin blushed again, gave a stiff cough behind a hand, and said with lofty solemnity, "I'm still injured. I can't hope to outrun or outclimb Ojutai's broodlings until I have recovered my full strength." "Yes, of course that's why," said Baishya with an extravagant eye roll. Naiva pinched her, and Baishya elbowed her hard. Grandmother smiled one of her rare, relaxed smiles. "This is your task, my girls. Children will be born knowing no other way than that of dragonlords. They will think it has always been this way, that humans can only bow to dragons, that the great dragons can't be defeated. But Ugin's story taught us another lesson, one the Spirit Dragon may not have intended. Even the greatest of dragons can die." "Do you truly think so?" Naiva asked. "I truly do. For in the unwritten now, anything may come to pass."